← Rain. Lots of it. 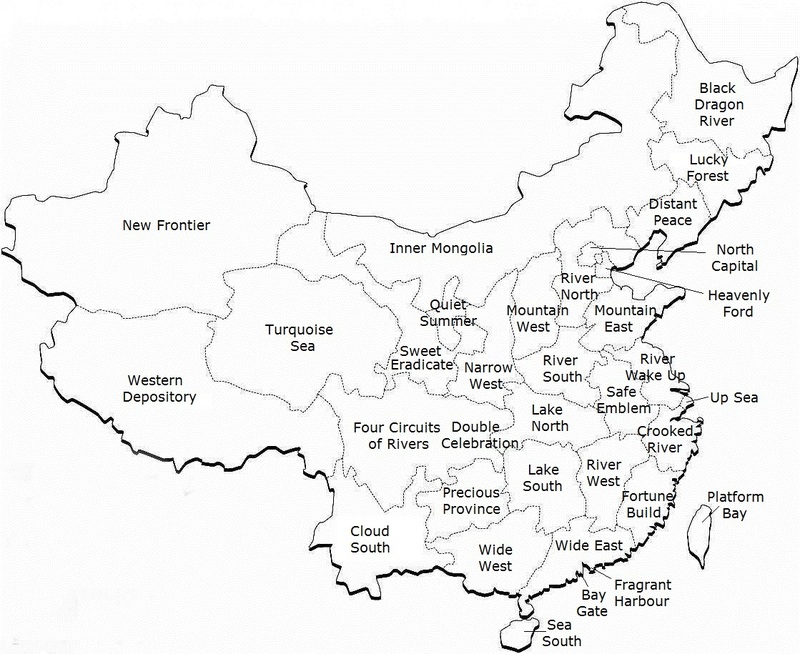 Not an accurate translation in many cases – for example “Cloud South” is just an abbreviation of “South of the Cloud Ridge Mountains” – but these are the names of China’s provinces (and autonomous regions, municipalities, special administrative regions, and, um, Taiwan) as they appear at first glance. Lots of ‘north’ ‘south’ ‘river’ ‘lake’ and ‘mountain’. This entry was posted in diary and tagged china life, photoshoppery. Bookmark the permalink. Lousy translation. “Up Sea” for Shanghai? Is the translator a native speaker of English? If so, then this is a really lousy translation. If you had read the blurb above you would have seen that it’s “Not an accurate translation in many cases, but the names as they appear at first glance.” – i.e. a pedantic literal reading rather than a serious work of translation and Chinese etymology. If you had read the ‘about’ section you would have seen that yes, I’m a native speaker of English. I think that “up sea” is my favourite one of all – it catches something of the very different ways our two languages work. Maybe you want to call it something like “on-the-sea” – which captures much more about English place names than it does Chinese ones – or maybe you have a better suggestion? Nice job except I have no clue why did you put Taiwan there? Unless you change the title to “China and Taiwan, translated” this inclusion wouldn’t make much sense to people outside the Celestial Kingdom. Taiwan is Republic of China, mainland is People’s Republic of China. So it’s not worth having an argument about, is it? Remember Hot River? That’s still a part of ROC. Sad that Tibet should be labelled a depository. It’s the depository of sacred buddhist texts in “Journey To The West” – so not really sad. I make perfect sense if you have ever had to read an instruction manual for something that was made in China, translated from Chinese to English. Since when, Xinjiang Uyghur Autonomous Region become frontier? Uyghur means “civilised” in Turkish. They’re living there for 3000 years as we know. Xin = new, jiang = frontier. I didn’t feel the need to translate “Uyghur Autonomous Region” because it’s already in English. Platform Bay was never part of the Middle Flower Person Populace Shared Peace Country!!! hi.. please post about india, how chinese names to india and its states translate? This is a very clever way of translating the map. Love it!